Rezvani, M., Taleshi, M. (2017). Editorial. Journal of Sustainable Rural Development., 1(1), 3-4. Mohammad Reza Rezvani; Mostafa Taleshi. "Editorial". Journal of Sustainable Rural Development., 1, 1, 2017, 3-4. Rezvani, M., Taleshi, M. (2017). 'Editorial', Journal of Sustainable Rural Development., 1(1), pp. 3-4. Rezvani, M., Taleshi, M. Editorial. Journal of Sustainable Rural Development., 2017; 1(1): 3-4. Director in Charge, Department of Human Geography, Faculty of Geography, University of Tehran, Tehran, Iran. In this regard, sustainable rural development has a distinctive role and can be defined as improving the quality of life for the rural people by developing capacities that promote community participation, health and education, food security, environmental protection, and sustainable economic growth; thereby enabling community members to leave the cycle of poverty and achieve their full potential. Sustainable development has received growing attention from academics, industry representatives, policy-makers, and so on. Sustainable development based research and education is the backbone of a society. In other words, science and research are critical to help meet the challenges for sustainable development, as it lays the foundations for new approaches and technologies to identify, clarify, and tackle global challenges for the future. Science and research can thus significantly contribute to sustainable development, but requires, to that end, a broad understanding of science as well. Scientific journals are periodical publications intended to further the progress of science, usually by reporting new research. These journals are very important in development and promotion of science and research. 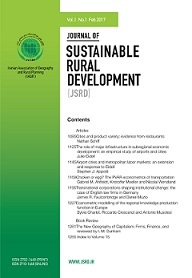 Journal of Sustainable Rural Development (JSRD) is an international, multidisciplinary, double-blind peer-reviewed, open-access journal published by the Iranian Association of Geography and Rural Planning. JSRD carries original and full-length articles that reflect the latest research and developments in both theoretical and practical aspects of environment, economy, and society with respect to sustainability. It provides an academic platform for professionals and researchers to contribute their innovative work in the broad field of sustainable rural development. Therefore, preference is given to articles that test, extend, or build strong theoretical frameworks while empirically investigate the issues with high importance for sustainable rural development theories and practices. JSRD calls for researchers and academician to submit their research papers in this journal about sustainable rural development.